Alliance Strategies Group, LLC (ASG) is pleased to announce it has been retained by Geoffrey Diehl, Republican for U.S. Senate, to help aide in his campaign against Democratic Senator Elizabeth Warren for the November 2018 Election. ASG will focus on increasing Diehl’s online presence and nationwide fundraising. 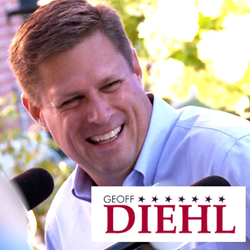 Geoffrey Diehl is a Republican State Representative in the Massachusetts legislature. As the representative for the 7th Plymouth District, he has taken on the special interest groups, the establishment and Democrats. He is a resident of Whiteman, MA, a proud husband, father, Eagle Scout and small business owner. During the primary preceding the 2016 Presidential Election, Diehl served as Donald Trump’s Massachusetts campaign co-chair. His proven track record of winning, not only elections, but for conservative causes, is what America needs.